This tutorial will introduce you to the topics and content available on the DOSITS web site involving the science of sound in the sea. It is suitable for grades 9-12. Additional science content is available in the Science of Sound section including Advanced Topics topics. In 1826 on Lake Geneva, Switzerland, Jean-Daniel Colladon, a physicist, and Charles-Francois Sturm, a mathematician, made the first recorded attempt to determine the speed of sound in water. 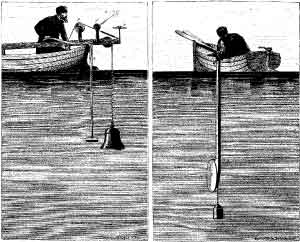 In their experiment, the underwater bell was struck simultaneously with ignition of gunpowder on the first boat. The sound of the bell and flash from the gunpowder were observed 10 miles away on the second boat. The time between the gunpowder flash and the sound reaching the second boat was used to calculate the speed of sound in water. Colladon and Sturm were able to determine the speed of sound in water fairly accurately with this method. J. D. Colladon, Souvenirs et Memoires, Albert-Schuchardt, Geneva, 1893. Sounds produced by marine animals, natural processes, and human activities fill the ocean. Because water is an effective medium for the transmission of sound, both marine animals and people use sound as a tool for finding objects, navigating, and communicating under water. Sound travels far greater distances than light under water. Light travels only a few hundred meters in the ocean before it is absorbed or scattered. Even where light is available, it is more difficult to see as far under water as in air, limiting vision in the marine environment. In addition to sight, many terrestrial animals rely heavily on chemical cues and the sense of smell for important life functions (such as marking territorial boundaries). Olfactory cues are restricted in the marine environment. Therefore the sense of smell is much less important to marine species. Underwater sound allows marine animals to gather information and communicate at great distances and from all directions. Many marine animals rely on sound for survival and depend on adaptations that enable them to acoustically sense their surroundings, communicate, locate food, and protect themselves under water. In addition to the variety of naturally occurring sounds (e.g. breaking waves, lightning, earthquakes) and sounds made by marine animals, there are many sources of anthropogenic (human-generated) sounds in the ocean. Sound in the sea can be a by-product of human endeavors. For example, over ninety percent of global trade depends on transport across the seas and shipping produces a great deal of underwater noise.